When thinking of the next adventure you would like to take on, the Niagara Falls in Canada might not make it to the top of your list probably because it doesn’t sound like an adventure at all. It’s more of a tourist attraction to some but did you know that there are fun and exciting things to do on your visit to this majestic wonder of nature? Yes! It’s more than just a border marker between the U.S. and Canada; it’s something that’s more than that! It features the American Falls and Bridal Veil Falls situated on the U.S. side and the Niagara or Horseshoe Falls on the Canadian Side. And if you want to enjoy everything that these beautiful attractions have to offer, you can do so by crossing over towards the Canadian side! While doing that, here are some fun and exhilarating things to do in your next Niagara Falls adventure. The Canadian counterpart of the American Maid of the Mist Cruise is called the Hornblower Niagara Cruise. It’s a great way to get close to the base of the falls that pours up to 600,000 gallons (2,271,247 liters) of water. You’ll be able to hear and even feel the power of this beautiful masterpiece of nature, and while doing so, you’ll need to be ready to get wet. Be sure to put on the waterproof ponchos that are given as souvenirs and keep all your gadgets somewhere that’s safe from the mist. Having an extra pair of shoes and socks is also a good idea. Night time cruises and attractions like the Falls Fireworks Cruise and the Falls Illumination Cruise are also available in case you want to have a unique experience. Schedule of voyages are set every 15 minutes starting April 1 towards November 30. Yes! You can enjoy a literal ‘bird’s eye view’ of the majestic Niagara falls through the WildPlay MistRider Zipline to the Falls attraction. There are 4 parallel ziplines which you and your friends or family can enjoy. 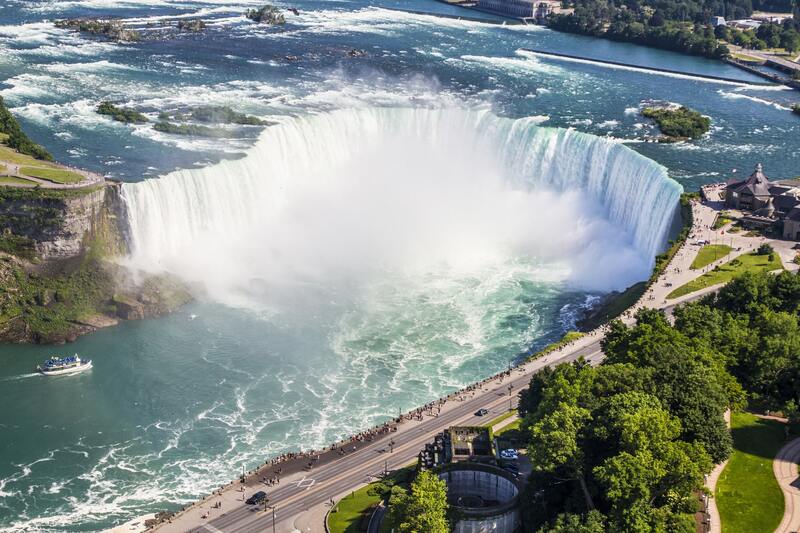 It is 220 feet (67 meters) high and 2,200 feet (670 meters) long hovering with an excellent vantage point of the American and Niagara falls altogether. Feel the excitement of flying at speeds up to 40 mph when you try this fantastic ride and be amazed by the beauty of the Niagara River Gorge just below. And if you’re hungry for more, you can try the other adventures and challenges available at WildPlay. There’s the Whirlpool Adventure Course which is a series of climbs, swings, jumps and a zip line that is suspended over the world famous Niagara river gorge and whirlpools. After you’re done with these, you can try the ‘What’s to Fear Jump’ which is certified to make your heart pound even faster. It’s a 40-foot loose-line jump that’s designed to complete your Niagara dare. Glen Nature Reserve is another attraction which you can enjoy on your trip to the Niagara Falls. It’s just a walking distance from the surrounding hotels at Niagara Falls, Canada. The reserve is one of the best-preserved nature spots along Ontario’s Southern Carolinian forests. You can enjoy the gardens and parks that extend along Niagara River Gorge’s banks which is a beautiful spot to relax while enjoying the beauty of the Niagara gorge and whirlpool. There’s also the hiking trails that take you through the virgin Niagara Escarpment. Moreover, you will also enjoy 2.5 miles or 4 kilometers of hiking trails with rocky terrain and beautiful rock formations all over making it a perfect spot for bouldering. You will also have the chance of learning even more about flora and fauna around the area as well as history and other geological facts and relevant information through the hiking tours together with a trained and knowledgeable tour guide. Guided Tours are scheduled to leave each day at 11 am and 2 pm all throughout the summer months. Lastly, you can enjoy even more sceneries in the Butterfly Conservatory and the Niagara Glen Nature Center where you can get a permit for your bouldering adventure. Journey Behind the Falls is an exciting way to enjoy the beauty and majesty of the Niagara falls as it gives you access through tunnels cut through the rocks behind the falls itself. These tunnels were built 130 years ago situated 125 feet above and are accessible through stairs that travelers and tourists need to climb. You’ll be amazed by the thunderous sound of water falling from above before reaching the end of the journey marked by the observation deck. You will also enjoy a peek through the observation panels that are carved through the rocks giving you a direct view of the falls from within. It’s a once-in-a-lifetime experience seeing with your naked eyes such great power of water crashing through the earth below it. And just like the cruises which allow you to observe from the front, you’ll also need your souvenir poncho when you get to the falls from behind. Keep all your gadgets safe and dry and bring an extra pair of shoes and socks which you can use right after the visit. A Wonderful Adventure You Need to Experience! As you can see, the Niagara Falls isn’t just an ordinary attraction which tourists can take pictures of. It is full of exciting activities and adventures which you can tick-off of your bucket list. From seeing the falls up-close to enjoying the different facilities and recreational activities available around the site, your trip will undoubtedly be one that’s going to be worth it! There’s much to feel excited about in Niagara than what you already think you know!